I can eat a peach for hours, here's why you should too. Peaches are a fan favourite. Juicy, sticky, wet—they're an ongoing mess but totally worth it. It's the last summer fruit before moving into the heartier apple season. Basically, it's your last chance to taste summer before the colours shift & everything falls to your feet. But there's so much more to this amazing fruit than sticky hands & happy buds. They're beyond good for you as well, duh. They originated in China & are a member of the Rosaceae family, the same as our other summer favourites, cherries & plums. Their oriental roots have them revered as a symbol of longevity & immorality. They have a velvety skin & their pulpy flesh surrounds a stone (making it a stone fruit). This stone carries an edible seed packed with health benefits of its own (more of that in future posts). Peaches are high in antioxidants, battling free-radicals & assisting in immunity. High in potassium, they are beneficial in the fight against hypokalemia as they help regulate metabolic function. The potassium is necessary to proper nerve signalling & cellular function in the body. Their phenolic & carotenoid compounds have anti-tumour, anti-cancer properties. 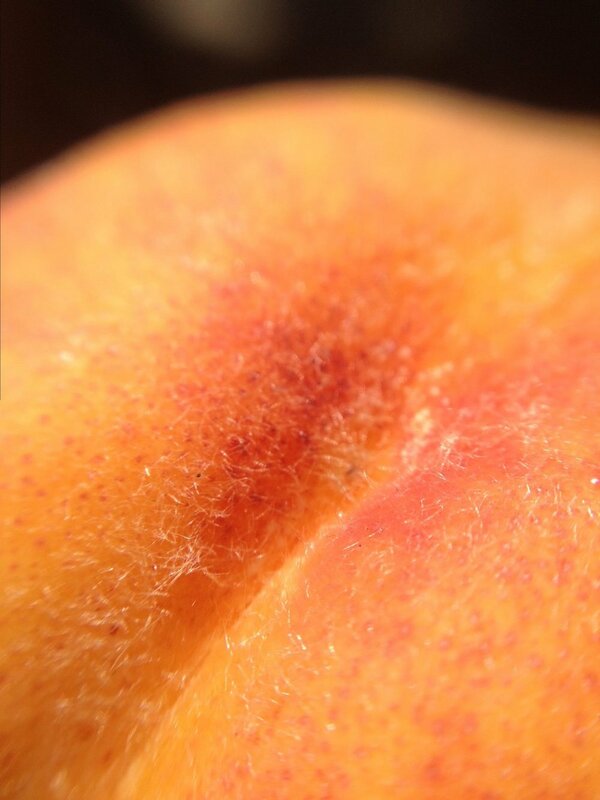 As an added perk, peaches are high in Vitamin C which not only help with immunity but also keep skin glowing. Their high flavonoid content has properties which ward off some of the damage caused by UV ray exposure. The rich Vitamin C source also assists in the absorption of iron, important in all life stages but particularly during pregnancy. The rich potassium source is also helpful to relax nerve cramps & fibre eases constipation. The bata-carotene is good for eye health. Peaches also assist overall nervous system health, treats obesity, has anti-aging properties, lowers cholesterol, promotes healthy bones, teeth, & cellular health , releases toxins, & combats neuro-degenerative disorders such as Alzheimers. To summarize, peaches are an excellent source of: Vitamin A, beta-carotene, Vitamin C (ascorbic acid), Vitamin E (phylloquinone), Vitamin B1 (thiamine), Vitamin B2 (riboflavin), Vitamin B3 (niacin), Vitamin B6, folate, & pantothenic acid. They are rich in minerals such as: calcium, potassium, magnesium, iron, manganese, phosphorous, zinc, & copper. Peaches contain zero saturated fat or cholesterol & are an excellent source of dietary fibre. Bata-Carotene is typically the strong red-orange pigment found in fruit & vegetables. It is a member of the carotene family. It helps maintain healthy skin & promotes eye health. Calcium is an electrolyte, promoting electrical charges throughout the body. It is needed to build & maintain strong bones, as well as heart, muscle, & nerve health. Carotenoids are responsible for the orange & red hues found in plants. They are free-radical fighting, thus cancer preventing & immune boosting. They convert to Vitamin A thus promoting clear vision & are associated with cardiovascular health. Copper is a trace element aiding in the proper function of organs & metabolic processes. It aids in the absorption of iron. Dietary Fiber normalizes bowel movements & helps maintain bowel health. It lowers cholesterol, maintains weight, & aids in glucose regulation. Folate is a B vitamin richest in green vegetables. An insufficient intake has shown to result in birth defect, cancer, & heart disease. It is considered a disease reducing vitamin. Iron is a key ingredient in the production of hemoglobin. Hemoglobin is in your red blood cells & carries oxygen through your body. Manganese assists in bone production & the maintenance of skin integrity & health. It also fights against free radicals & blood sugar control. Magnesium helps regulate a diverse range of biochemical reactions in the body including: energy production, structural development of the bones, it’s an antioxidant, transports calcium & potassium. It also aids in the regulation nerve impulses, muscle contraction, & the maintenance of normal heart rhythms. It is an electrolyte, promoting electrical charges throughout the body. Pantothenic Acid has historically been known as B5. It is a water-soluble vitamin that allows us to use fats, carbohydrates, & proteins as energy sources. Additionally, our immune system would collapse without it & we'd be unable to make hormones. Phosphorous " is a mineral that makes up 1% of a person's total body weight. It is the second most abundant mineral in the body. It is present in every cell of the body. Most of the phosphorus in the body is found in the bones & teeth." (Mediline Plus) It is important for the use of carbohydrates & fats in the body. It is needed for the protein production responsible for growth, maintenance, & repair. It aids in the production of ATP (energy) & is required for kidney function, muscle contractions, healthy heartbeat, & nerve signals. Potassium can be found in most food, particularly leafy greens. Like magnesium, calcium, & chloride, it's an electrolyte, promoting electrical charges throughout the body, as well as an essential mineral in the maintenance of proper blood levels & the maintenance of healthy heart & nerve function. Vitamin A is fat-soluble & essential for immune function, vision, reproduction, & cellular communication. It is an essential ingredient in rhodopsin, one of the proteins that absorb light. It is key to cellular differentiation & growth. It is necessary for proper formation & maintenance of heart, kidneys, liver, & other organs. Thiamine, vitamin B1 is essential for glucose metabolism. We need it so that we can use carbohydrates as energy. It is also necessary for proper nerve, muscle, & heart function. Riboflavin, part of the B-vitamin group (B2), is required for many enzyme reactions including the activation of other vitamins. Niacin or B3 lowers cardiac risk & improves (HDL) cholesterol levels (lowering triglicerides). Vitamin B6 aids in the production of red-blood cells & the metabolism of carbohydrates. It's essential to the brain & nervous system health, liver detoxification, & is believed to have anti-inflammatory properties. Vitamin C is one of the vitamins humans are not able to produce themselves. They can only get it by consuming it through food or supplements. It's required for the absorption of iron, maintaining immunity, & correcting protein imbalances. It's also an antioxidant in the fight against free-radicals. Honestly thought, its list of uses is a mile long. Vitamin E is an essential antioxidant component protecting cells from cancer & heart-disease causing free-radicals. Zinc is an essential mineral involved in cellular metabolism. "It is required for the catalytic activity of approximately 100 enzymes & it plays a role in immune function, protein synthesis, wound healing, DNA synthesis, & cell division." (National Institutes of Health). It supports growth & is necessary for proper sense of taste & smell. The body is unable to store zinc, so it needs to be consumed daily.